Your patio is the heart of your summer patio experience, dine and relax in style whilst staying protected from the sun’s harsh rays. 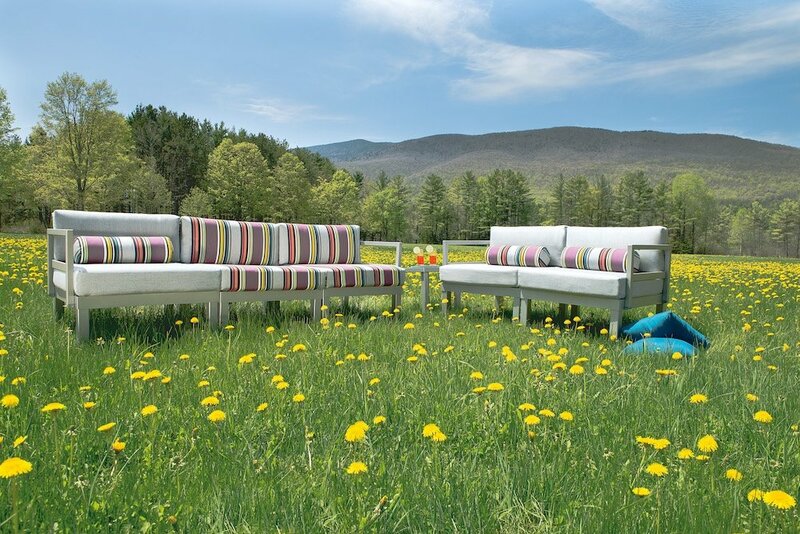 Choose a patio furniture set that is unique in style as you are. Let’s take a look at some inspiring patio furniture sets that come with an umbrella. The Aruba Balcony (left) comprises of a small table and 2 chairs and is ideal for couples who want to eat or share a drink together. The Aruba Sling is a larger set that is lower down. It’s great for casual dinners in a group or in a family. This smaller set (left) provides a great dining experience for a group of 4, whereas the larger set has room for a group of 8, which is perfect for large families or groups. Manufactured using aluminum and Marine Grade Polymer (MGP), this product is the perfect choice for coastal locations. The Leeward Collection uses MGP in its construction, which means that it is water-resistant and will not crack, rot or go rusty outdoors! This collection is inspired by the sea and is great furniture for properties near the ocean or a pool. It incorporates angles and clean lines, whilst maintaining a classic, large-scale frame. This collection is a modern and seductive style with unique curves. The aluminum won’t rust and is made to last. With elegant arms that sweep back, the Ocala sling collection has a classic but modern style that is perfect for family dining in a large group. There are loads of different chair options too so it really caters for all tastes and requirements. The high backs on the chair add a really sophisticated element to the design. This collection has reversible cushions and is great for families with young children! Also, the chairs can be stacked easily if you need to put this furniture away for the winter. The frames are aluminum that is powder-coated and have vinyl straps for the seat and back cushions. The Cape May Collection is a really durable design. This is a smart yet comfortable dining set that is great for homes as well as the restoration industry. The sling fabric is replaceable on this furniture, which means it is a great choice for families with young children or pets. The frame is made from durable aluminum, which will last years. There are many configurations to be had with the Oceanside Sling Collection. This is a beautiful design that is robust and made to last. This is a great collection as there are so many different seating and styling options to choose from. The frames are made from strong aluminum and you can choose chairs with cushions or a sling chair that is padded too for maximum comfort. The Landings has a choice of finishes and sling fabrics as well as different seating options. The chairs are stackable too, which means that you can easily store your patio set away for the winter. This is a minimalist-look furniture collection that is constructed using extruded aluminum. There is a variety of options available so you can customize this design to your tastes and style. This is a truly stunning style that will suit any patio or garden space.